When I saw the bright Nikon S2 in a used camera store in Osaka Japan in the summer of 2003, I knew it had to be mine. 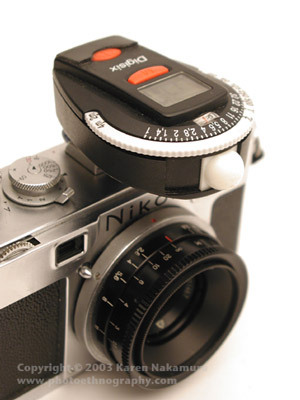 The Nikon is a classic camera of the late 1950s that uses the Nikon 'S' mount, a bayonet mount that is similar to the Contax 'C' rangefinder mount used in classic Contax rangefinders of the 1930s-1960s (not the current Contax G range). Later, I found a mint condition Nikon S3 with mint 105mm f/2.5 that also had to be mine, and bought it. The Nikon mount is almost identical to the Contax mount. Lenses from both systems will mount on each other, but because Nikon used Leica's standard of 51.6mm focal length for their standard lens, rather than the 52.3 of Contax's system, there is a very slight incompatibility between the Nikon and Contax system. Infinity is the same on both, but there is a 7° maximum difference in close focusing between the two. For focusing at infinity or when using wide-angle lenses, this slight difference is enveloped within the depth-of-field of the lens. But when using large aperture normals (50mm f/1.4) or long lenses (>75mm), there will be a focusing disparity at short distances. Kiev and Contax: More information about the Kiev series of Contax descendants is on my Kiev 4a page. Suffice it to say here that Former Soviet Union (FSU) lenses that use the Kiev/Contax mount are totally compatible with the Contax system. And you can use FSU Kiev/Contax wide-angle lenses on Nikons without a problem although the long lenses will run into the same Contax/Nikon incompatibility. Here is my Nikon S2 pictured with the excellent Jupiter-12 35mm f/2.8 clone of the Zeiss Biogon (along with its normal 50mm lens inverted). Cosina-Voigtlander: Cosina of Japan has recently announced the first new production lenses for the Nikon 'S' and Contax 'C' mount for over three decades. The new wide angles in particular use aspheric surfaces and look to be excellent. I'm really excited about this! They've also produced Bessa R2S and R2C cameras, which are compatible with the Nikon and Contax rangefinder mounts, respectively. Jupiter-12 35mm f/2.8: The Jupiter-12 is a copy of the Zeiss Biogon, a very famous 35mm f/2.8 design. Because it isn't retrofocus, the rear element almost touches the focal plane curtains of Nikons/Contaxes. The rear element actually hits the double metal shutters of the Bessa R2S/C and cannot be used with those models. But... with all those caveats... if you have a camera that works with the Jupiter-12, then it's a stellar lens. The non-retrofocus design means that there is very low distortion. Overally, very, very high quality. It's a bit of a pain storing the lens when it's off the camera because the rear element is so vulnerable. Don't buy it unless it comes with the rear lens cap especially designed for it. The standard Nikkor 5cm (50mm) f/1.4 lens on the Nikon 'S' rangefinders is renowned for its sharpness and clarity. It had a very long production life, basically existing from the first Nikon S to the last Nikon S4. During its production, it went from chromed brass to black painted aluminum, as seen on the Nikon S3 to the right. The optical formula remained the same. 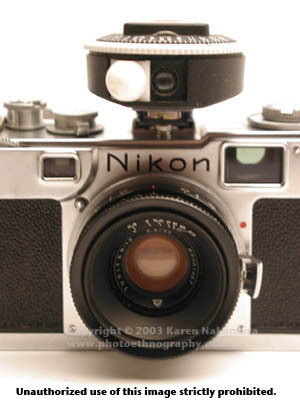 It also lost the 'C' in Nikkor-S.C. which indicated coating. Nikon decided that since lenses from all manufacturers were being coated in the post-War period there was no reason to advertise it anymore. The Nikkor-P 10.5cm (105mm) f/2.5 lens is one of the lenses that won Nikon over in the United States. It was bitingly sharp with excellent resolution. Photojournalists were flocking to the Nikon system. This lens has a long and hallowed life. After its incarnation as a Nikon Rangefinder Lens, it was reborn as a Nikon 'F' mount SLR lens. I bought my 105mm in mint condition with case and caps as part of a larger lot that included my Nikon S3. It was really quite a coup since these lenses are getting rare, and the caps and hoods for them are getting even rarer.